The maniple came about the same way the stole did. It was a plain linen napkin that was a smaller version of the sudarium and was called a mappa. The Greeks and Romans used the mappa to wipe their mouths and hands at meals. Both before and after the meal, two servants would attend the guests. One would serve the guest a basin of scented water for washing up, and the other servant would wipe the guest’s hands with a mappa that he carried on his left forearm. Its Use in the First Century The mappa – or a smaller version which was called the mappula – was an official badge of the Roman empire. It was used to let chariot racers know when the race was to begin. Priests also began using the mappa to wipe the communion vessels and hands at celebrations. They wore the mappa on their left wrists. During the Fourth Century, deacons began to carry linen cloths, and by the Sixth Century, these pieces became established as a church vestment. One was found in the coffin of Saint Cuthbert, who died in 687 A.D. The first official writing that mentions the word “maniple” (or actually “quinque manipuli”) was found in a deed written in 781. It had become the distinctive badge of the subdeacon. During the Tenth Century, people began adding embroidery, fringe, beads and sometimes even jewels to this vestment accessory. Bishop Riculfus, who died in 915 A.D., left to his successors six of these embroidered with gold. One such piece even had little bells. It had now become purely ornamental, except for the one the subdeacon used, which was still a practical linen cloth. Making this important part of a vestment set is very similar to making a stole. 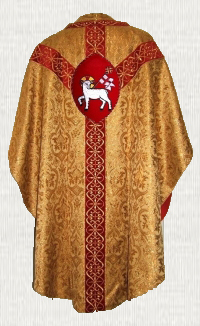 To learn how to stitch this vestment piece, click here.